We're huge fans of outdoor wall murals, street art and graffiti, so every time we travel to a new destination we try to find it. We're particular fans of outdoor wall murals in a coastal and beach theme, particularly by the artists Wyland and David Dunleavy. You'll find many of their wall murals documented right here on our travel blog. 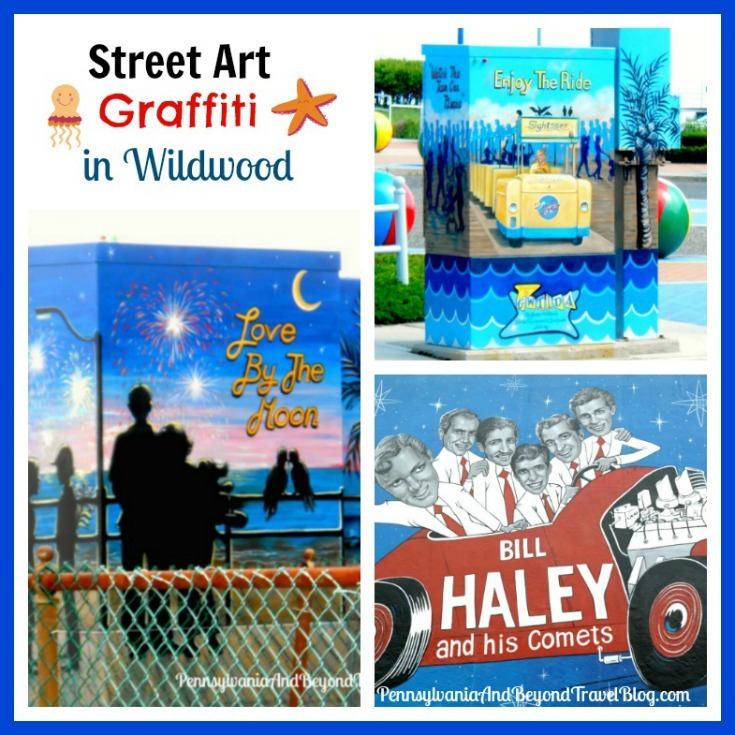 Wildwood in New Jersey has a lot of artistic street art designs that you'll see painted on the sides of hotel/motel buildings, on the walls of restaurants, murals up on the boardwalk and I love all of the different designs that you now see while sitting at a stoplight on those electrical traffic light boxes. While driving around on the Wildwoods island (yes, it's a barrier island) in New Jersey, we spotted the artistic designs that we're featuring in our blog post today. These are just a small sampling of what you'll find when visiting the island. You can find a ton of them documented in our wall murals & street art section right here on the blog. The Bill Haley and his Comets wall mural is part of the Doo Wop Musical Icons Series and it's number 2 out of 3 that I'm aware of. You can find it on the side of a building on Pacific Avenue, one of the main avenues that runs north to south on the island. If you're into street art, I recommend starting on Pacific avenue on the north end and taking it south...you'll see a lot of great pieces! Up in North Wildwood we found this Beach Life Wall Mural painted on the side of a small motel that sits within the beach block area. I'm not sure of it's official title but it was painted by MG Signs who does a lot of the murals up and down the Jersey Coast. This one reminds me of vacation memories from my childhood when my brother and I would spend hours on the beach every summer playing in the sand and building sandcastles. The boardwalk has some great wall murals too! This one which features underwater sealife was painted by one of my favorite artists...David Dunleavy. You'll find it painted on the side of the Fudge Kitchen's building up on the boardwalk. It sits on a corner, so make sure you walk around to the side of the building to see it. On Pacific Avenue you'll find the American Safari Motel and on the side of their building you'll find this fun American Safari Wall Mural. I think it really sticks out due to the fact that it isn't beach, ocean or island themed. It was painted by MG Signs and while it's pretty...it just sticks out like a sore thumb. Just my 2 cents on that. As you're driving around on the downtown streets and through the business district in Wildwood you'll come across those electrical traffic light boxes that I previously spoke about. Forgive me, I'm not sure what you officially call those boxes! Anyway, you'll find them at the various intersections and each one is done in a different theme and all of the designs pertain to the Wildwoods Island, the Beach and/or the famous Wildwoods Boardwalk. They're colorful and very artistic in nature. I really enjoy seeing them! The Sightseer Tram Car design was located up by the Convention Center by those famous Wildwood Beach Balls, across from the StarLux Mini Golf Course. The Sighseer Tram Car is an icon on the island! The Love by the Moon design was located down at an intersection in the downtown business district. I believe we saw it on or around Rio Grande Avenue. The Greater Wildwoods Tourism Improvement and Development Authority (GWTIDA) sponsored these particular designs and the others that you'll find. As you can see...Wildwood is a great place to visit if you enjoy seeing outdoor wall murals, street art and artistic graffiti. You'll find gorgeous designs all over the entire island...so the next time your down to the Jersey Shore for a visit...spend an hour driving around and checking out all of the beautiful designs.